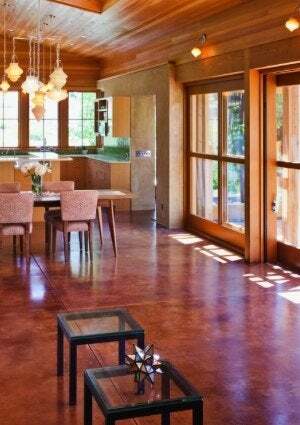 Applying stain to a concrete floor can add beauty and depth to this hard-wearing material, and make it even easier to maintain. If your concrete floor is already in good shape, you're just a few easy steps away from a durable, dramatic new finish. 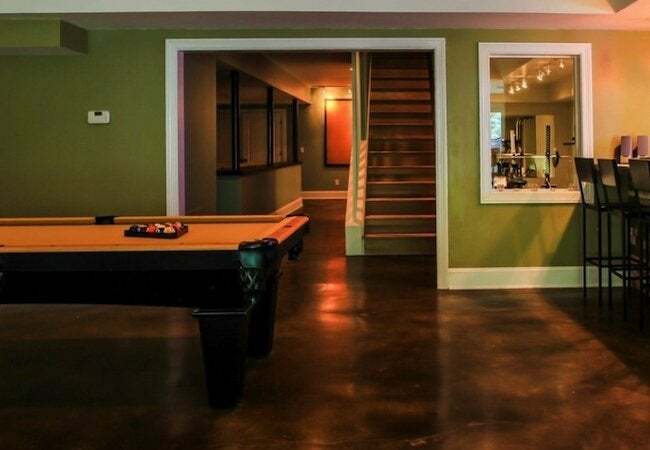 Homeowners used to think of concrete as being strictly utilitarian stuff, resorted to only when a better-looking material would be either unsuitable or far too expensive. Today, many people appreciate not only the hard-wearing durability of concrete, but also its aesthetic qualities, which can be greatly enhanced by a number of different techniques. One popular way to finish concrete is through either acid- or water-based stain. I recommend acid: It lasts longer and looks better. The downside of acid stain, however, is that it can be somewhat unpredictable. Rather than coating on like a wood stain, acid concrete stain generates color through a chemical reaction. Results depend in part on the stain you’ve chosen and how much of it you apply, but also on the concrete itself—its location, age, and mineral composition. The color you end up with may be quite different from the one you expected to get. And there’s no way to erase or undo the stain once you’ve applied it. Your only option is adding more stain to intensify the effect. To stain concrete successfully, the first step is to prepare the surface, being sure that it’s free of residual adhesive, flaking paint, and similar debris. Scrub the concrete with a solution of TSP and water. Treat stubborn stains aggressively with a degreaser or chemical paint stripper. Mechanical abrasion is a last resort. Tape off any sections of the concrete surface that you do not wish to stain. Do this very carefully, as it may prove impossible to remove the stain if it lands somewhere you didn’t intend it to go. To get an impression of how the stain is going to look, test it in an inconspicuous corner or along a remote edge of the concrete. Don’t love how it looks? Adjust the stain accordingly, diluting or intensifying it. Now you’re ready to start applying the stain. The goal here is to achieve even coverage. To that end, many choose to employ a sprayer (whose parts are plastic so as not to corrode upon contact with acid). After spraying—never so much that there’s puddling—use a shop broom to ensure that no parts of the surface look relatively darker or lighter. If necessary, spray again to eliminate marks left by the broom. Different stains take different periods of time to set properly; consult the label on the product you have chosen. While the stain is setting, the chemical reaction actually continues. It ceases only when you neutralize it by washing the floor in a solution of water and detergent (and sometimes baking soda). Finish up by protecting the stained concrete with a sealer. Again, consult the product label; it’s a good idea to use the manufacturer-recommended sealer. Indoor concrete flooring is usually sealed with wax, although in a high-traffic area, I would opt for epoxy beneath urethane. Note that you can use a buffing machine to facilitate the sealing process, so long as you are working on a floor surface indoors.